Totally, there are nine Amsterdam train stations. The most important train station is, of course, Amsterdam Centraal. This is the station that the vast majority of travelers to Amsterdam will arrive into from Schiphol airport or on an international train and its central location means that it is used for most train travel within the Netherlands as well. 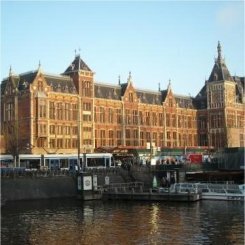 Follow the link for our separate page on Amsterdam Centraal Station, the biggest station in Amsterdam from where all international trains depart. This page focuses on the other 8 train stations in Amsterdam. Amsterdam Centraal Station: see here. Amsterdam Bijlmer ArenA Station is the closest train station to the Amsterdam ArenA and the Heineken Music Hall. Woonmall Villa Arena and the Amsterdamse Poort shopping centre are also close by Bijlmer. It has a GWK money exchange, bike rental, several shops, cafes, and eateries. Amsterdam Lelylaan Station is a small station in the west servicing the districts of Slotervaart. This station can be found between Rembrandt Park and Sloterpark. It has a bike rental, a few eateries and an Albert Heijn convenience store. Many trains between Amsterdam and Schiphol stop here, but not all. Amsterdam Muiderpoort Station is small, located close to both the Oosterpark and the Dappermarkt street market. This station is also useful for those staying at the large Stayokay hostel in this part of the city. It has some food stalls, a small book shop, a bike rental and repair, and a Greenwheels car depot. Amsterdam RAI Station is so called because of the Amsterdam RAI Exhibition and Convention Centre. This station also has two metro lines connecting to it (also to Amstelveen). It has a guarded bike stands, bike rental and a few shops. Amsterdam Sloterdijk Station is a major one, and very close to the Bos en Lommer district of Amsterdam, in the west. This Amsterdam train station also offers trains to Schiphol airport. It has waiting rooms, a GWK money exchange, an ING bank office with ATM, public phones and internet access points, several book and record shops, an Albert Heijn convenience store, several eateries, bike rental, guarded bike stands and paid parking for cars. Amsterdam Zuid Station is the station used by visitors to the World Trade Center. It has waiting rooms, public toilets, internet access points, bike rental, paid parking for cars, a Greenwheels car depot, guarded bike stands, several shops and eateries. Duivendrecht Station is located in the south east of Amsterdam and is also served by the metro. Duivendrecht is one of the Amsterdam train stations that can be used to reach the Amsterdam ArenA. 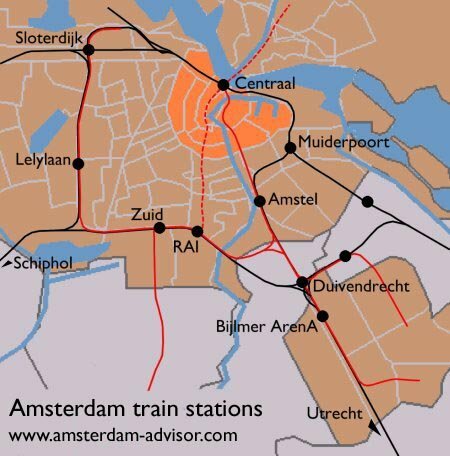 All train stations are connected to the Amsterdam metro system, except Amsterdam Muiderpoort. All trains in the Western part of the Netherlands are run by the NS (Nederlandse Spoorwegen). They all are non-smoking. Don't buy tickets inside the train, as a 35 fine will be added to the fare. Buy them in advance at the yellow-blue ticket machines (they will all accept credit and debit cards on the Visa, Maestro or Cirus systems, and some also accept euro coins) or buy them at the ticket office. Find all domestic train schedules by calling 0900-9292 or through www.ns.nl. An even better site for planning your trip is www.9292ov.nl since it also includes buses, subways and trams. You can't reserve domestic trains. 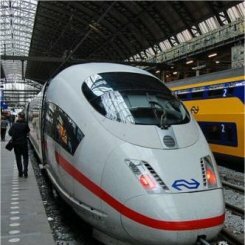 Find international train schedules on www.nshispeed.nl or by calling 0900-9296. 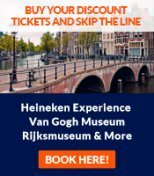 Through the same, you can also reserve/buy international train tickets (which is usually obliged).You can also buy them at the international train travel desk at Amsterdam Centraal Station, but waiting lines are often long. Domestic and international train schedules are also posted at the yellow boards in the stations.